A huge gas explosion in Seattle destroyed several buildings and injured nine firefighters, the Seattle Post-Intelligencer reports. 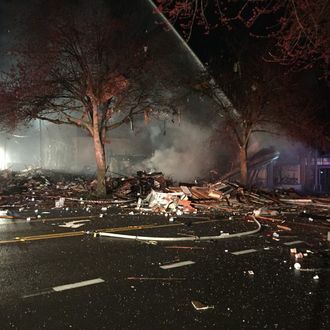 At around 1:40 a.m. in Seattle’s Greenwood neighborhood, residents were awakened by what some described as an “extremely loud boom” reportedly heard ten miles away and followed by “raining glass.” The Mr. Gyro’s eatery and the Neptune Coffee café were gone. According to NBC News, 67 firefighters and medics in at least 17 fire trucks were on the scene. None of the injuries reported were apparently severe. The Local Fox affiliate said that a natural gas leak had been reported 40 minutes before the explosion.